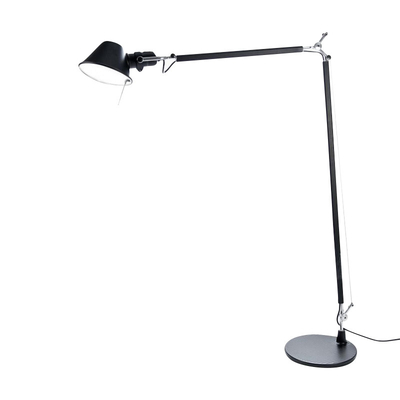 An extension to the iconic Tolomeo family, Tolomeo reading floor is an adaptation of the iconic Tolomeo table lamp into a reading floor lamp. Available with or without shade. Fully adjustable articulated arm structure in extruded aluminum in high polished anodized finish. Joints and tension control knobs in polished die-cast aluminum. Tension cables in stainless steel. 7” Diameter diffuser available in parchment paper or in pale grey satin and polycarbonate fiber blend. Diffuser remains vertical regardless of arm angle. Weighted steel base with stamped aluminum cover.